The ICA (International Cartographic Association) conference in Durban was the intention why Lilli and I decided to spend our honeymoon in South Africa. Durban is a city where I wouldn't spend too much time if not necessary. Besides some nice restaurants and the beach there is not too much to it. The only thrilling thing was not to get mugged while walking from the conference center to the hotel. After one week conference Lilli joined me at the City Lodge hotel where we spent another night till Sunday. Using the baz bus we arrived at Umkomaas where we checked in at the backpacker managed by Shawn and Wanita. We walked to the "Aliwal dive charters" diving school, where we planned to make our PADI open water diver course for the next 4 days. The rest of the day we spent watching dive videos, learning the first chapters of our exercise book and eating the delicious crayfish prepared by Shawn. After doing some exercises in the pool on Monday we started our first sea dive on Tuesday. To get out to the Aliwal Shoal, breaking waves, 2 to 4m high, have to be passed by an inflatable boat. This was maybe more thrilling than the dive itself! The first dive took us down to 12 to 18m where we started to get comfortable with the new equipment, the environment and tried to get neutrally buoyant. Lots of different fish were passing by close to us and the sandy and rocky surface. After some minutes Guillaume, our diving instructor, took us to a place called raggies cave. The name comes from the tooth ragged sharks which are living there. About 5 sharks, maybe 2m tall, surrounded us slowly. In the evening Mike and Christoph joined us at the backpacker. Unfortunately Christoph wasn't able to dive due to a cold he got from surfing at the beach in Durban. The next day Mike joined us for our last dives of our course. Again we saw lots of sharks and other fish. Due to the rather cold weather we decided to stop diving for one day to have a relaxing walk at the Oribi Gorge reserve near Port Edward. Besides some monkeys and a rather disappointing waterfall (dry season) the area is not too spectacular but nice for a one day walk. On Friday Lilli, Mike and me were guided by Guillaume to the Produce, a ship wreck at the Aliwal Shoal which sunk in the 70ies. The wreck is about 200m long, 14m high and lies on a depth of about 32m (!). This area is probably one of the most spectacular sceneries at the Aliwal Shoal. Due to the strong current, using an anchor line was the only way to get down to the wreck. Once being there diving through the holes of the wreck and lots of different fish was even more fascinating than facing a shark. The pictures were taken by a 12 Euro waterproof camera. Everybody promised me that it won't work below 2m depth. As you can see it did work, although the quality is pretty bad but I have at least some proofs of our shark visit. Mike and Christoph dropped us off at the airport in Durban where we rented a car for the rest of our trip. Having the steering wheel on the right side, the gear box on the left, and driving on the wrong side of the road I had to struggle through Durban downtown. We headed in the direction of the Hluhluwe park, where we found a nice campground on the way there. Next morning we drove to the Hluhluwe park where we accidentally got a graveled road which leaded us directly into the park without paying any permit. After watching zebras, elephants, giraffes, buffaloes, rhinos, and a lot more we checked in at the Hilltop camp where we booked a rondavell for the night. At 6 o'clock in the morning we took part at a guided tour with a ranger telling us different interesting stories about the park and it's animals. After leaving the park our next destination was Sodwana Bay, a nice coastal dune area with the southern most coral reef of the world. Unfortunately we got the wrong road, so we had to drive 70 kilometers on a sandy rough road. Of course we planned another dive to the reef, so we reserved a morning dive for the next day at the "Coral Divers". Due to the conditions during winter (strong currents, bad visibility) the colors of the reef were not that intensive as we expected them to be. But nevertheless the fish were amazing and we even saw dolphins directly passing by at our boat. The pictures were again taken by a low cost camera without flash light, so the colors of the fish and corals are pretty bad, but at least we have something to show. The rest of the day we spent on driving to Port Edward where we hoped to get some information about the Wild Coast Trail which starts over there. After 6 hours driving, we decided to stay for over night in the backpacker at Umkomaas where we have already been the week before. The next day we arrived at the Kuboboyi river lodge, another backpacker, which was recommended as one of the best in SA, and indeed it was! Eric and Mike own this beautiful located house, with a pool in the garden, monkeys on the mango tree, birds singing and sh..... on your tent, and a gorgeous beach nearby. After wasting at least 2 telephone cards trying to get a permit for the Wild Coast Trail, Eric convinced us to make a guided tour with Amadiba Adventures. The next tour started on Thursday so we had some time to relax, to watch the whales, to hike and to fill our stomach with the delicious meals cooked by Eric and Mike. The wild coast at the eastern cape offers 280 kilometers of coastal wilderness between the Umtamvuna river in the north (Port Edward), and the Kei river in the south. Unlike the famous Garden route or Otter trail this area is mostly untapped by tourism. Only few graveled roads lead to the coast, most of the area has to be discovered by foot. The region was declared as homeland (Transkei) on 26. October 1975 and was reincorporated into South Africa in April 1994. About 95 percent of the population is rural, and it is probably one of the poorest regions in South Africa. Permit - As mentioned above, getting a permit for the wild coast via phone is nearly impossible. The numbers I got were either not valid, or the people I phoned to had no idea about any permit. I think the only way to get a permit might be to go directly to the Nature Conservation Devision of the Agriculture and Forestry Department at Umtata or East London. Huts - When you get a permit, there is a strict time schedule which tells you the exact date of all your overnight stays. Some years ago the government built huts for accommodation, which are all destroyed now! So if you plan to do the trail on your own bring a tent with you. River crossings - At all larger rivers there are local people who provide canoes for the crossings. For all the other rivers you have to be very careful that you cross them at the right time. Some rivers are impossible to cross when there is high tide. Swimming across them when the water is coming in is rather impossible due to the strong current, and all guides say that there is even a risk of getting attacked by sharks in the estuaries. So plan your trip with a tide table! Food supply, water - There is no possibility to buy any food along the coast, you have to take all your food with you. During winter, there is not too much water around but it is sufficient. We drank only boiled or filtered water and had no problems at all. Literature - I found only one book that describes the trail in details: The Guide to Hiking Trails - Exploring Southern Africa on Foot by Willie and Sandra Olivier, 1988, but it's pretty old and some things have changed. E.g. : The military zone at Mkweni river is no longer restricted to hikers. We crossed it directly at the beach. On Thursday we arrived at the Mzamba Craft Market near Port Edward, where we were supposed to meet our guide and the other participants. From the beginning on there was no doubt for us that we would have a great time with Liz, Nathan and Rachel who joined us for the next 6 days hiking. Also Christopher was a perfect guide who told us lots of stories about his culture and the specific environment at the Wild Coast. Day 1: Mzamaba Craft Market - walking along the beach till Mzamba river - walking inland till Mnyameni river - crossing Mnyameni river by canoe - again walking inland till the Kwanyna trail camp at the Kwanyana river. Day 2: Visiting Berea Red Sands - walking along the beach till Sikhombe river - walking inland till Mtentu Trail Camp at the Mtentu river - Kajaking at the Mtentu river. Day 3: River crossing of Mtentu river with kayaks - crossing the Mkambati Nature Reserve close to the coast - Weol ship wreck - walking inland to nice pools - wading through Msikaba river - accommodation in huts close to Msikaba. Day 4: Short walk inland to the Lambazi huts, passing by Kilroe Beach and Port Grosvenor. Day 5: Walking close to the beach to Grotto Cave - walking uphill to the top of the cliffs - Cathedral rock - Mfihlelo waterfall - walking inland to Gutweni. Day 6: Walking back to the coast - Arriving at Mbotyi - Returning to Port Edward by car. Although we have never been above 300m altitude during our whole vacation (which is rather unusual for mountaineers like us) we really enjoyed the beautiful landscape, the diversity of the animals (above and below sealevel! ), and the hospitality of the people. 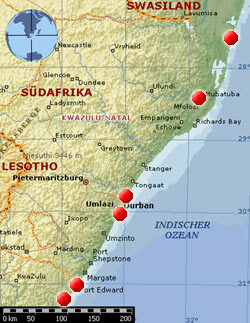 Thanks to all of you who have provided us with information about South Africa and the Wild Coast Trail!